If you are seeking out for the hills of Darjeeling a bit away from the tourist populated town center to experience the nature, sprawling tea gardens, waterfalls, river streams, mountains & valleys, forests and villages, then Darjeeling has some great offerings. 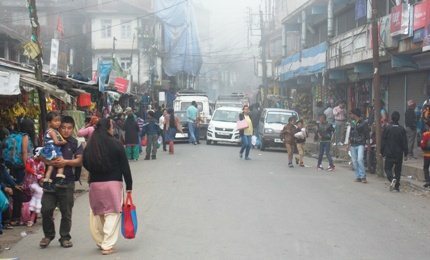 There are some wonderful places that you can visit from Darjeeling town on a day trip and return by the end of the day. You will need to book a car from the taxi stand or use one of the Tour Operators. In case you want to save on cost, you will get buses from Chowk Bazaar and shared jeeps from the taxi stands at Chowk Bazaar and Gandhi Road. Shared jeeps take about 10 persons. Sometimes they stuff in even more. You can however book more than one seats or even a full row if you are looking for comfort. You will need to find out the timings for both forward and return trips in order to complete your day tours in time. You may not find buses to all the destinations. This is one of the most popular day trips from Darjeeling. Mirik is a small hill town located at an average height of 5000ft. The highlight of this place is the large central lake in a picturesque setting. The lake is popular for boating activities. On the western bank of the lake, there is a forest area having a 3.5km long walkway. You can plan for a picnic by the lake side. There are ample eateries available as well. Mongpu (also known as Mungpoo) is a quiet mountain village and located about 35kms from Darjeeling town. You will see lovely tea gardens along the way, Cinchona plantations which Mongpu was once well known for, Orchids, flower nurseries and of course lovely view of the hills and valleys. You will also visit Rabindranath Tagore Museum at Mongpu which was the poet's summer residence. You will see his original paintings here, verses and several original household belongings. This is an excellent circuit which covers several mountain villages including Takdah, Tinchuley and Lamahatta. Other than getting stunning views of the mountains, you will visit lovely tea gardens, orchid center, wonderful manicured garden etc. Kalimpong is a district of Bengal and has wonderful sightseeing places. While many tourists plan overnight stays in Kalimpong which has its own charm, a day trip from Darjeeling is also easy and popular. It takes about 2 hours one way. Take a private car from Darjeeling, come up to Jorebunglow and take a left turn into Peshoke road. The road goes all the way up to Teesta, crosses over the bridge and then from the opposite side another road rises up to Kalimpong. You should selectively visit East and West Kalimpong. Some of the must see places are the picturesque army golf club, Durpin monastery and viewpoint, Cactus & Orchid centers etc in west Kalimpong, and Dr Graham's home, Mangal Dham and Dello Hills GTA tourist complex etc in east Kalimpong. Budget some 7 hours including lunch. This is a sprawling and one of the best sanctuaries of north Bengal comprising several forest areas. Spreading across 158 sq. km area on varying elevation levels, the sanctuary has Royal Bengal Tigers, Elephants, Himalayan Black Bear, rare mountain goats, porcupines and many other exotic animal life. The sanctuary is home to many resident and migratory birds. There are regular morning and afternoon safaris that operate from the Sukna gate of the sanctuary. It's about 2 & 1/2 hours drive from Darjeeling town center. You can plan a wonderful full day trip to Namchi of south-Sikkim from Darjeeling. It takes about 2 & half hours one way. 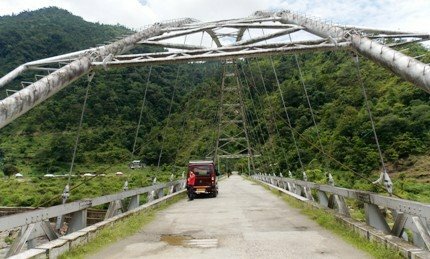 Along the way you can see the tourist spot Jamuni by river Rangeet and then go past Jorthang to reach Namchi which is known as the hub of culture and religious tourism in Sikkim. Some of the highlights of the day trip include Char Dham which is a huge temple complex on Solophok hill with a giant statue of Shiva along with replica of the four famous dhams of India and twelve Jyotirlingas, Shirdi Shai Baba Temple, Namchi Rock Gardens, great monasteries, Helipad etc. Jorpokhri is a wonderful tiny village on a hill top that offers natural water tank, forest area which is part of a nature reserve and wonderful views of Kanchenjunga. Not many tourists know about this tiny gem. It's only about 19kms from Darjeeling town. The route is via ghoom and Sukhia Pokhri. You can either take a private taxi to complete the day trip. Bijanbari is a small town in a picturesque valley located some 30kms away from Darjeeling town. 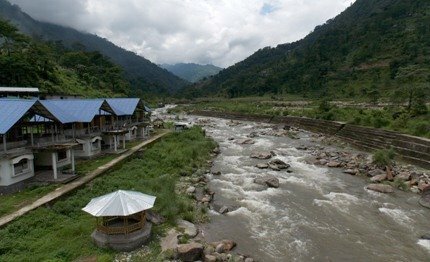 If you are looking for a wonderful scenic drive that leads to a sleepy town, walk around to experience the simple life that people live there, spend some leisure time by the side of the river Little Rangeet that flows through a bed of boulders, and take a short light trek to scenic spots, Bijanbari can be a mind blowing experience. The scenic winding road from Ghoom drops by over 4000 feet in a stretch of 22kms passing through lovely tea gardens, waterfalls and valley area. You must see it to believe it. I have seen several river confluences, but this one is special. It forms a torrent at the meeting point and a white sandy delta. You can either go down to Triveni (which is located near Teesta Bazaar) or see the confluence from Peshoke View Point. The round trip from Darjeeling takes about 3-4 hours. This is a recently established tourist spot in Darjeeling. Although the place has always been known for its natural beauty combining hills, river, waterfalls, a bridge, village etc in a picturesque valley like setting, it has been recently converted formally into a tourist place by the Darjeeling authorities. In January 2013, Bimal Gurung, the leader of GTA (the body administering several sub-divisions of Darjeeling District) has inaugurated Jamuni as a tourist spot. Jamuni is located in north Darjeeling. The road next to St. Joseph's College (North Point) on Lebong road goes down to Jamuni. It takes about 1 hour to reach by road (about 15kms from Darjeeling). 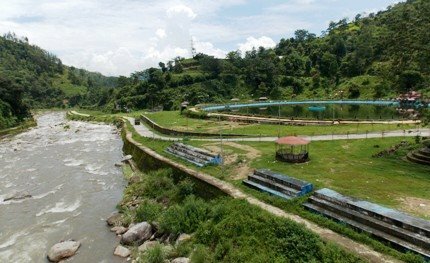 Locals say that Jamuni has now started challenging Mirik, because it too has a beautiful lake that offers boating facilities. Since the altitude is lower here, you can also swim in the waters of the lake. However the artificial round lake is much smaller than that of Mirik. Overall landscaping of the place is magnificent. The Rangeet River flows by the place and you can see the stream flowing over the rocky bed and for a long distance. In fact you can deep your feet into the water of the stream or even swim (but be very careful, the water current could be quite strong). There is a nice bridge here which crosses the stream. The vehicles go over the bridge. You can stand on the bridge and soak in the views all around. The views of the river and that of the landscape looks lovely from the bridge. This bridge has a strange name - Happy New Year Bridge because it was inaugurated on a year beginning. There is also a lovely waterfall here. There is a plan to construct a large structure of Buddha in Jamuni in near future as well as an amusement park to give a boost to tourism in this part of Darjeeling district. Private cars/taxis are available from Darjeeling for a day trip to Jamuni. A round half day trip fare by a small car is Rs. 1500/- . There is also a combination trip offered to Jamuni along with Rope Way (Cable Car) ride. On your way back, the car will drop you at the cable car lower level station (Tukvar) and you can then take the cable car back to Darjeeling, having had two great experiences in one day tour package. Note that the development of Jamuni as a tourist place is still incomplete and therefore you won't get much amenities here. There are no restaurants or shops yet, so carry your own food. It's a great place to picnic. Every year during the winter (usually in December) a local country fair (mela) sets up at Jamuni. Villagers from all over the hills come here selling local produces including vegetables, fruits like oranges, farming & dairy products, cattle etc. Chrysanthemums are colorful flowering plants. So the tour is through the places in Darjeeling where such flowers bloom in abundance. You will take the road via Ghoom for Sukhiapokhri (or Sukhia in short). There are several tea gardens and villages here. Within 2 kms from Sukhia you will reach Jorpokhri which is so named because of two natural lakes (jor means two and pokhri stands for lake). This is the abode of Salamanders, small lizard like amphibians that were once considered to be extinct. Jorpokhri offers sweeping views of Darjeeling on one side and majestic Kanchenjunga on the other. A great place to spend an hour or so during a day tour. You will then drive towards Maneybhanjang, a little border town between India and Nepal. It's famous for the Friday haat (country market). This is the place from where all the fascinating treks to Sandakphu and Singalila region take place. You will see the steep uphill route that the trekkers take. Next you will visit Pokhriabong - a small village in Sukhia block, and Nagri Farm - now a sprawling tea estate on Rongbong valley owned by the Chamong group. Nagri Farm tea estate lies between an elevation of 2500 to 6400 ft on mountain slopes. You get breathtaking views of the mountains and valleys at various scenic spots. You will pass through some of the best tea gardens of Darjeeling. Both Pokhriabong and Nagri Farm offer wonderful flower nurseries, centuries old monasteries and great picnic areas like Tiffin Dara and Sangary Tar. By the way the name Nagri Farm originated when a British man Mr. Greenhill had set up a dairy farm here in mid-1800s, named it Nagri Farm, but later converted it into a tea estate, but the original name still remains. You can take the tour by booking a private cab from a taxi stand in Darjeeling or booking car through an operator. 2) Visit Darjeeling Tours & Sightseeing for many other great tours and rides in Darjeeling. Can a jeep safari from Darjeeling - Singalila National Park and Sandakphu done in a day ? If yes can you please share any recommended operators. No it can not be done in a day. Darjeeling to Manebhanjan takes over an hour by car, then you need to change the vehicle (will take a while here). Manebhanjan to Sandakphu takes about 4.5 hours one-way with a small break in between. So it's impractical to plan a day trip to Sandakphu from Manebhanjan. Hi, Can you give a rough idea of the rate for the Day tour of Takdah, Tinchuley and Lamahatta in the month of April? Hi, a small reserved cab fare would be around Rs. 3,000 - 3,500 during high season for a full day trip, i.e. 9am to 5pm (April-end would fall into high season). If you go through a Tour Operator, the cost could be higher. Hi Raj, Nice Article this. I just had one question though; How feasible is planning one day visit to Lepchajagat from Darjeeling?, that is, staying night back in Darjeeling after a full day visit in Lepchajagat. I mean, Are there taxis available from Lepchajagat to Darjeeling and if yes then till when should we cover all to not miss the last one? Hi, Lepchajagat is about 19kms from Darjeeling via Ghum and will take about 45-50 minutes by taxi. So you can easily make a day trip to Lepchajagat from Darjeeling. You will usually find passing shared-taxis at Lepchajagat to get back to Ghum (some return all the way to Darjeeling). From Ghum you can get a shared or private taxi to Darjeeling. Taxis ply on this route until around 5pm (however after 4pm the frequency reduces). I am attending a course in NBU. I have a Sunday off. Can I travel to darjeeling and back the same day? If not , I can spend 1 night in Darjeeling but have to be back by 10am at the university on Monday. What options are available early morning for returning from Darjeeling? Yes you can make a day trip to Darjeeling. Start early and preferably take a private taxi. You can also take a shared jeep from Siliguri. Hi Raj, I am planning to come in Oct 1st week 2017, pls confirm if we can cover Tsomgo lake & Nathula pass in oneday starting from darjeeling and return back to NJP/Darjeeling. Thanks in advance for taking out your time to respond. Hi, if you start very early in the morning (around 5am) and arrange it through a Sikkim tour operator, it is possible. A vehicle from Darjeeling can not go beyond Gangtok. If you visit Nathula, by the time you get back to Darjeeling/NJP, it may be late in the evening. Such day trip is not recommended. Dear Raj, First of all, thank you for such a splendid and informative site. It is really helpful for tourists to plan their trip. Actually, I am planning to visit Darjeeling on a short trip with my family in first week of December and wanted to get your expert opinion regarding the selection of day trips. I wanted to know which one amongst the day trip to 'West Kalimpong', 'Mirik Lake' and 'Takdah, Tinchulley and Lamhatta' is best to take. I can choose only 2 day trips. Please suggest. You can choose any two. Mirik will give you a different flavor of great tea gardens along the way and the lake. You can also cover Jorpokhri (another beautiful mountain lake) on the way to Mirik. Is Lepchajagat suitable for day around trip from darjeeling?How much the taxi fare for this trip? Lepchajagat is close to Darjeeling, will take about 45 minutes one way. But it's not suitable for day trip as there are hardly any public facilities and nothing much to see in a short day trip other than being in a forested area. A rough return fare by reserved taxi would be around Rs. 1500. Better to take a shared Jeep/taxi via Ghum. Hi Raj, Would like to take this opportunity to offer our heartfelt gratitude for providing us with such an informative travel portal on Darjeeling. I happen to frequently visit Darjeeling because the place simply fascinates me. This time we are planning our trip to Darjeeling from 24th December to 28th December with friends and family. It would really help us if you can suggest a couple of places which could be covered as a day trip from Darjeeling. Also would you suggest a trip to Sandakphu (overnight stay) during this time, keeping into consideration that we will be having children and elderly people travelling with us. Eagerly waiting for your valuable suggestion. Thanks. Hi, for day trips you can consider 1) Takdah (Orchid Center, Rungli Rungliot tea garden), Tinchuley, Peshoke Tea garden and Lamahatta... this is a full circuit. Start early. 2) Namchi in South Sikkim. You can read articles in my site. Skip Sandakphu... will be too cold and tiring for seniors and kids. Re-visiting Darjeeling after almost 3 decades. Born and raised in Siliguri and went to North Point in the 80's. I would love to know if the tea estates offer a day trip where you can learn all the process that goes into making tea. while I know most of the process, I have a girl friend who I would love to show. Love Darjeeling !!! Thank you so much for answering everyone's questions. Thank you so much in advance. You can visit the factory of Happy Valley tea estate in Darjeeling (during tea plucking season). The local workers offer guided tour of the factory and explain the different stages of tea processing. Hi, Gangtok is not suitable for day trip from Darjeeling, Kalimpong and Mirik are. While private taxis from the stand are usually okay, day time drinking among the drivers is not rare either. I would suggest you take a car and a driver from a well known local operator like Ashmita. They offer discounts on Darjeeling Tourism Card as well. Is it possible or worth for a day trip to Singalila National Park. If not, can you suggest any off-beat day trip from Darjeeling. Something worth for me may not be worth for you. Singalila Day Trip from Darjeeling may not be doable unless you start very early in the morning. It'll take about 3.5 hours one way. You can however alternatively make a day trip to Takdah (visit Rungli Rungliot tea estate, Orchid Center), Tinchuley (view of Teesta, Peshoke Tea Gargen ... take the new road through Peshoke tea estate) and Lamahatta (roadside manicured garden on hill slope with pine forest). First of all I would like to thank you for sharing and guiding us through your valuable information. I will visit Darjeeling with my father (64 yrs) and mother (58 yrs) on 20th June and will return on 23rd. I am planning sightseeing on 20th and 21st in Darjeeling and 22nd I was thinking of visiting Gangtok. Is it possible to visit Gangtok and return on the same day? If I want to start a bit early then by what time can I avail a shared jeep? which are the places to visit there? Or if I only opt to visit the tsango Lake! will it be feasible? If there is any possibility then what will be the approximate fare in a shared jeep. will it be too tiring as the lake is quite distant from Gangtok ? Is there any shared jeep available to Jorpokhri? what will be the fare or else what a private cab will charge for a to n fro journey? I want to utilize all the 3 days there hence quite confused what to do .. your suggestion will be valuable to me. I have already seen Mirik so doesn't want to go there. From Darjeeling drive to Gangtok takes about 4 hours. So a day trip is not possible. You won't be able to see anything there plus it'll be a long tiring journey back to Darjeeling. Tsango lake is another 3 hours from Gangtok. I have described several places under day trips (in Sightseeing Tours menu option) and also under offbeat stays. Choose one from there. You can only solve your own confusion because only you know what you like and what you don't.